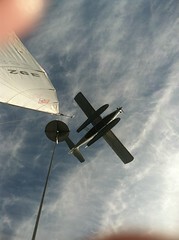 Fantastic lesson, everyone picked sailing up quite quick, and we had fun with the buoy roundings. 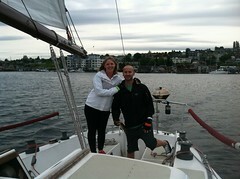 A wonderful lesson, both people did a great job on sail trim and driving, even though we did do a couple circles. The perfect way to start the morning. A sail with some fantastic people. These two did really well especially in light winds. I was even able to catch a picture of the seaplane that buzzed us. A family of five, with 3 little boys. We had a great time, using the binoculars and seeing the lake. We opened the drawbridge and all the boys had a change to steer the boat and pull lines. Towards the end of the 3 hours the winds picked up and the boys had a great time sliding back and forth in the cockpit. The best Thursday ever! What a great way to unwind after a stressful day at work, like a mini Staycation. Weather: 71 degrees, some clouds. The perfect way to end a day of sailing, with more sailing and a beautiful sunset. A great family, celebrating their father. 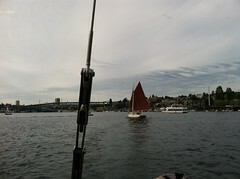 We were even able to sail under the Aurora bridge, as requested by one of the guest. 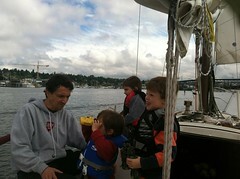 A great way to celebrate a birthday, dinner at the Salmon House, and sailing on Lake Union. 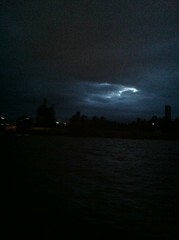 The winds were great, and the boat was flying, and the night sky was pretty amazing. We sailing almost 14 miles, in just just a couple hours. I let the birthday girl drive for a bit, can you tell when she was at the helm? A great way to celebrate father’s day. 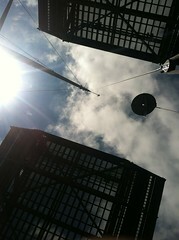 A father and daughter came out sailing and had a great time. He was on the helm most of the time and I was just pulling lines. What a perfect way to celebrate an 80th birthday. 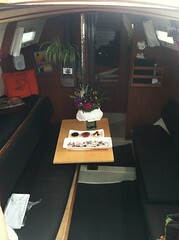 We have the caterer on the boat an she did great. She cooked up a feast, everything from breakfast to lamb for lunch. Plus there was oysters on a half shell. 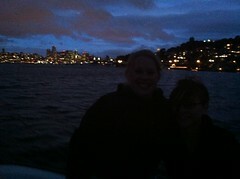 We went out to Lake Washington & sailed all the way across the lake. Oh and did I mention there were fruit tarts for the birthday girl? 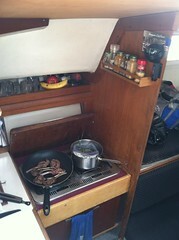 Claire did a fantastic job cooking on the boat. Follow the link to find out more about her. 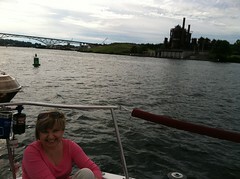 A great day to relax on the boat, we headed out through the canal, opening both the University & Montlake Drawbridges. Then sailed for a couple hours a grilled chicken & veggies.